Fox’s new dinosaur drama has a bit of everything: a bit of Blade Runner, a bit of Stargate, a lot of Jurassic Park, a substantial amount of every soap opera ever produced, and an almost unlimited amount of commercials. Jason O’Mara plays Jim Shannon, a cop who plays by his own rules in the year 2149. Shelley Conn plays Dr. Elizabeth Shannon, his wife, with Landon Liboiron as their brooding son Josh, Naomi Scott as their brainiac daughter Maddy, and Alana Mansour as their precocious daughter Zoe. The trouble is, with rampant pollution and declining resources, families are restricted by law to two children. Jim is imprisoned for resisting arrest when the government finds Zoe, but manages to break out of his maximum-security prison and break into the maximum-security time travel station just in time to pick up stowaway Zoe and join the rest of the family emigrating back 85 million years to join a human colony trying to build a new society. There they meet Terra Nova’s irascible leader Nathaniel Taylor, played by Stephen Lang. That’s just the first fifteen minutes. Jim gets a slap on the wrist, because after all, the time rift is one-way, and they’re down a man in the gardening department. After the usual adjustment period of, oh, about an hour, Jim gets startled by a giant worm and Zoe wanders off and has fun hand feeding the giant herbivore dinosaurs that just happen to be munching outside the compound’s fence. Josh, feeling depressed because he had to leave his girlfriend behind, immediately hooks up with hottie Skye (Allison Miller) and her band of nonconformist friends as they sneak outside the fence to go swimming and drinking in the Restricted Zone. Of course the teens are attacked by carnivorous dinos, while at just the same moment, rebels attack Terra Nova. Luckily, the dinos’ hearts don’t seem to be into it and the kids survive with all their limbs intact, albeit with a few scratches, and they come home to lots of hugs and kisses. And the rebels manage a peaceful prisoner exchange and drive off. But Jim holds a gun really well, and even manages to save Taylor from a rampaging dino, so Taylor makes him a security officer and then info dumps lots of confidential information to him that hint at Big Mysteries to come. We probably should have known there was trouble in Terra Nova land when the pilot got pushed back from last May, and most of the writing staff got laid off. The pilot was recut to emphasize the family drama aspect and to downplay the dinosaur action. Because, hey, who wants to watch that messy Sci-Fi stuff in a show about time travel and dinosaurs? The real problem with Terra Nova is that it is a rip-off of a British series called Outcasts shown on BBC America this summer. Humans fleeing a dying Earth to form a new society? Check. Human colony cut off from everything they’ve known? Check. Colony set in an inhospitable world? Check. Colony faces attacks by elemental forces? Check (dinosaurs in Terra Nova, violent sand storms in Outcasts). Exiled humans living in the wilderness? Check. Head exile has some mysterious relationship to the colony’s leader? Check. Exiles have resources the colony needs, and the colony has supplies the exiles can trade for? Check. Strange artifacts found in the wilderness that may challenge everything the authorities told you about this world? Check. Colony run by an authoritative leader with the help of a female doctor and a freethinking security officer? Check. Rebellious child makes trouble? Check. Off-world humans attempt to use colony for their own selfish purposes? Check (according to descriptions of upcoming episodes). Dull-as-dirt pilot episode turns into fairly engaging series filled with sociopolitical and religious themes that make you think? Time will tell, but I won’t hold my breath. 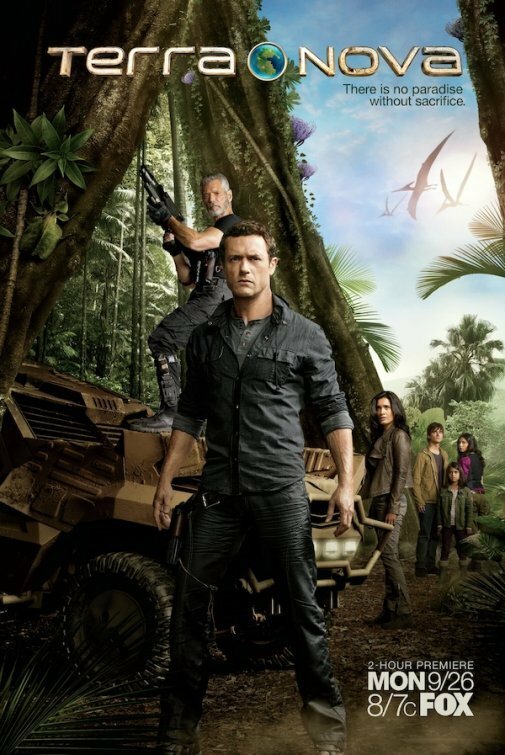 Terra Nova has potential; hopefully the producers are smart enough to know where to tweak it (it’s the dinosaurs, stupid) and Fox will give them enough time to transform it into a hit. Otherwise, it’ll join Firefly, Flash Forward, and a myriad of other could-have-beens in the discount DVD bin. This entry was posted in Science Fiction, TV and tagged outcasts, science fiction, terra nova, TV. Bookmark the permalink.